When looking for a healthy way to use the one giant sweet potato I bought at the grocery store the other day (why? your guess is as good as mine), I discovered a ton of recipes updating culinary classics to include the deliciously orange vegetable, upping the nutritional content of the dish. High in fiber, beta-carotene, vitamins C and B6, sweet potatoes can be easily whipped up into an awesome alternative to French fries, a creamy base for a healthier potato salad, a component in a filling stuffing, or even as thickener in custard. This recipe is neither of those things, but instead a sort of hybrid side dish that various potato-based recipes inspired. The quinoa adds a filling, gluten-free graininess, and the broccoli a colorful crunch. On its own or accompanying a main dish, this creamy and wholesome salad is a supersatisfying alternative to a plain starch or carb, and better for you at that. So I ate mine with polska kielbasa, not especially known for its nutritional value. So what? Kendra Vaculin is a junior at Northwestern University. Despite the fact that she loves cooking and eating real food, she has been known to survive entire days on fruit snacks alone. Read more about what she’s eating and wearing on her blog North South East Dressed. Place the sweet potato on a baking sheet and into the oven. Bake for 50 minutes, or until soft when stabbed with a fork. While the potato is baking, steam the florets of the head of broccoli until bright green. Drain and set aside. When the potato is done baking, run a knife down it long-ways right under the skin; there will be a pocket between the skin and the vegetable, and with a slit cut, it will be easy to peel all of the skin away. Roughly chop the sweet potato (it will be very mushy in some parts). 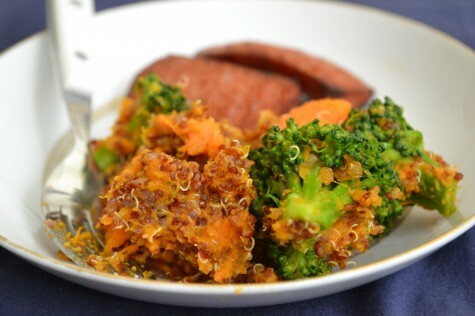 Add sweet potato to quinoa. Mash slightly with a fork, allowing some potato pieces to stay larger and some to be mashed into the grain entirely. Add the broccoli, salt and pepper and mix to combine.